Sometimes the best solutions are often the simplest. Case in point, a humidifier diffuser. They can create a moist environment in the air with only the water from your sink. They also double as essential oil diffusers with the addition of a few drops of scented oil. The most used essential oil in the world, this ancient oil has antioxidant, sedative, antimicrobial, and calming benefits. It has been shown to reduce anxiety and stress and help with headaches. Used at night, it can also help to improve sleep. This oil is useful in improving respiratory functions, whether you have sinus problems, congestion, or inflammation in your chest and throat. The natural antibacterial properties of eucalyptus oil, make it useful in relieving symptoms of sinus problems, chest congestion, coughs and sore throats. This freshly scented oil has been shown to focus an anxious brain and improve memory. The refreshing scent can help to invigorate you. Like lavender oil, this oil is known for it’s warming and calming properties. A lovely citrus scent, this oil lifts your spirits and has a positive impact on your mood. 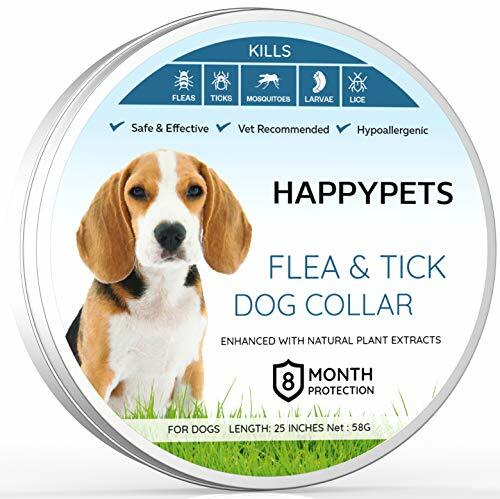 It is also known to repel insects, so has multiple benefits. An invigorating herbal scent, this oil is known for it’s energizing effects on mood. It also can improve memory performance and alertness. 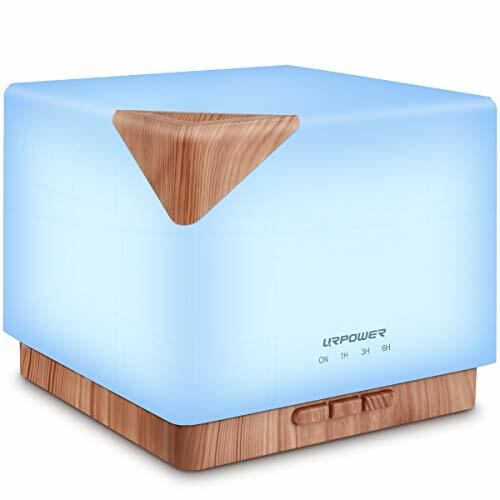 This essential oil humidifier by URPOWER has been redesigned to produce more mist than the previous humidifier. It adds moist, comfortable air, that can be enhanced with pure essential oils. As practical as this humidifier is, I love that it doubles as a soothing lamp that has seven color changing options. It also includes a night light mode. The light can be adjusted between bright and dim for each color option. My favorite color is the sky blue color, but you can pick any color from the rainbow too. The light can be turned off completely, in case you need absolute darkness when using it. It’s also whisper-quiet, so you can leave it on while you are sleeping. 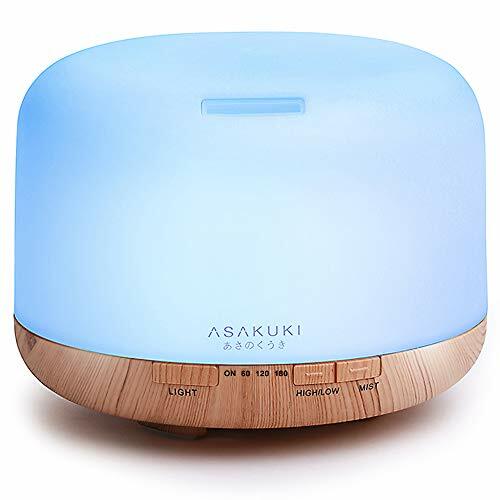 Ready to be used as a humidifier or oil diffuser, the Asasuki ultrasonic humidifier gives up to sixteen continuous hours of use at a time. The large 500ml tank is easy to clean and doesn’t need refilling often. If the water runs out when you aren’t around, it will automatically switch off thanks to the auto-off safety switch. 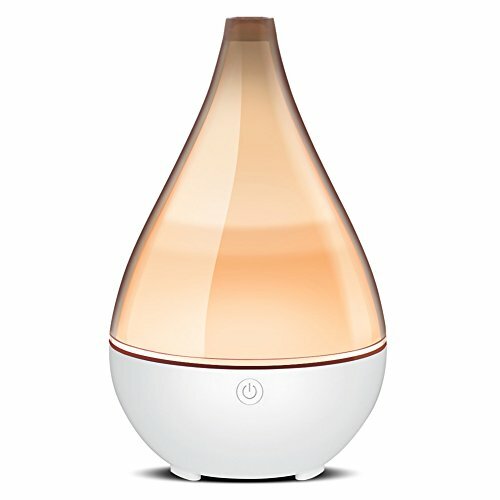 The ultrasonic aroma diffuser features a vibrating plate that creates an even mist. The mist is even and can be set to two ultrasonic mist settings – strong and weak – which are both quiet. 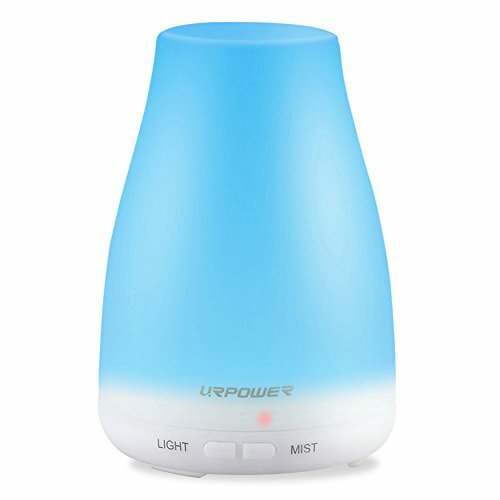 Like many of these soothing humidifiers, it features a color changing setting. Depending on my mood, I like to change the colors. You can pick from soft red, aqua, lavender, blue, bamboo green, yellow, and sherbet orange. The lights that power the mood lights are LED’s, which are long-lasting and very energy efficient. The light can be switched on or off at any time and adjusted for brightness. In addition to the humidifier, you also get a pouring cup, power cable, and a quick start guide to get you up and running quickly. If you will be using it as an oil diffuser, just add two to three drops of your favorite essential oils. I like to mix one drop of lemon oil with two drops of peppermint oil, for an awakening mist. I always feel so refreshed afterward. 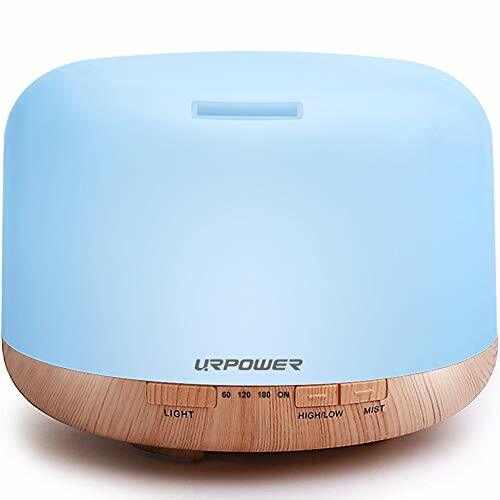 Another easy to use humidifier is the URPOWER Aromatherapy humidifier. The all-white device takes up little space and blends into any setting when it’s not in use thanks to its minimalistic appearance. When it is switched on, it can be set to seven color settings including white. It can be used as a humidifier and supply an even mist of clean water. To turn it into an oil diffuser just add a few drops of essential oils to the water tank before switching on. 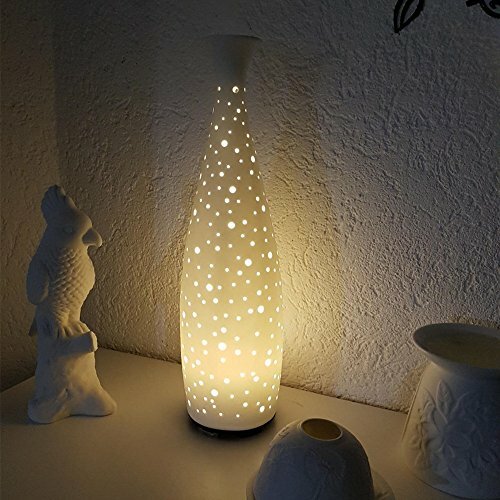 It can also be used as a night light without any mist dispersing from the humidifier. It holds 500ml of water, which is about three cups of water. Once it is filled to capacity, it can run for up to 10 hours of continuous misting. When the water runs out, the humidifier will switch off to save energy and for safety purposes. This essential diffuser with timer, can be set to various time settings. You can set the mist function to stay on continuously or you can set it to one hour, 2 hours, or three-hour intervals. The mist can also be set to high or low setting, depending on how much mist you need. If you want the light completely off, just press the “Light” button until it turns off. In addition to the humidifier, you also get a small measuring cup, a power cable, and a user manual. If you’re looking for a humidifier that you can fill up and leave running for over 20 hours, you will love this one. It holds 700ml of water, which means it needs less refilling and runs longer than most humidifiers. I’ve recommended this humidifier to all of my friends and they all love it. It’s whisper-quiet and also has an automatic shut-off function when the water runs out. Using it is straightforward and intuitive. I like that it has three separate buttons for the light, mist and time settings. You can select any of seven colors for the light or turn the light off completely. If you select a low-mist mode, it will run for over 20 hours. Selecting the high-mist mode will make the humidifier run for about 10 hours. You can choose to keep it running on a 1-hour, 3-hour, 6-hour, or on a continuous setting. It’s good if you only need to use for a few hours at a time. Add a few drops of your favorite essential oil to the water and you will have hours of diffused scent in your room. This humidifier has a 300 ml water capacity and can run up to 10 hours on one full tank of water. You can either set it to run continuously until the water runs out or run it for 3 or 6-hour intervals. The mist itself can be set to either weak or strong, depending on your needs. There is a subtle strip of light that changes to any of seven color options. If you don’t want anything too flashy and distracting, this is a nice subtle design. I really like the bamboo finish and I find it warms up my space nicely. 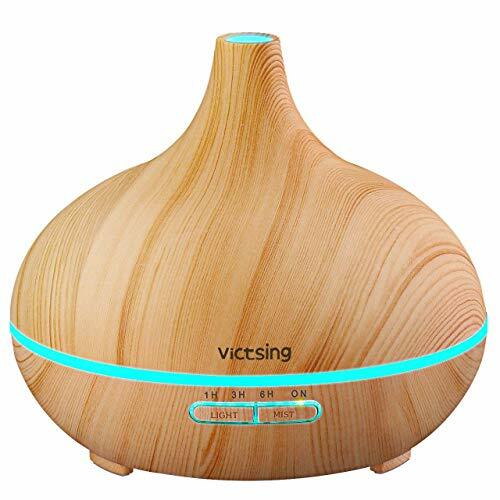 This humidifier from VicTsing has a unique and compact design. You can use it as a humidifier by just adding water. But, it can also be used with a few drops of essential oils, turning this into an oil diffuser. It’s an interesting combination of natural and modern elements. The outside features a wood-grain design, but it also features a color-changing band of light that glows. If you don’t like the thought of a humidifier with color changing lights, this is a nice compromise. It’s less of a feature, compared with other humidifiers I’ve reviewed. The humidifier holds up to 300ml of water and can run for up to 10 hours. I found it very quiet, which is due to the ultrasonic technology. When the water completely evaporates, the humidifier will automatically shut off, to ensure safety. You have 7 colors to choose from when changing the light settings. 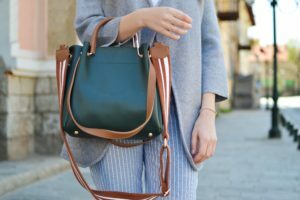 It can stay on the color you’ve chosen or it can also change colors slowly. Each color is adjustable between a dim and a bright setting. There are four time-setting modes – 1 hour, 3 hours, 6 hours, and non-stop. This humidifier is another subtle color-changing humidifier. The oval humidifier has a beautiful wood-grain design, which is split in the middle by a thin LED light feature. The colors can be set to one of seven colors and look nice combined with the wood. I think it would fit with any decor, because of the organic design. A little smaller compared to many humidifiers, this holds up to 200ml of water. This would be great to use in a smaller room or even in an office setting. Two buttons on the front allow you to change to the color of the LED lights or to change the timer. It can be set to bright or dim, depending on your preference. The light can also be completely switched off too. The humidifier can be set to be on for 1 hour, 3 hours, 6 hours, or continuously until the water runs out or you turn it off manually. I found it quiet and easy to use. I like that this comes with a 12-month warranty, just in case there are any faults. If you’re looking for something that is out of the ordinary, this is a really fun humidifier to try. 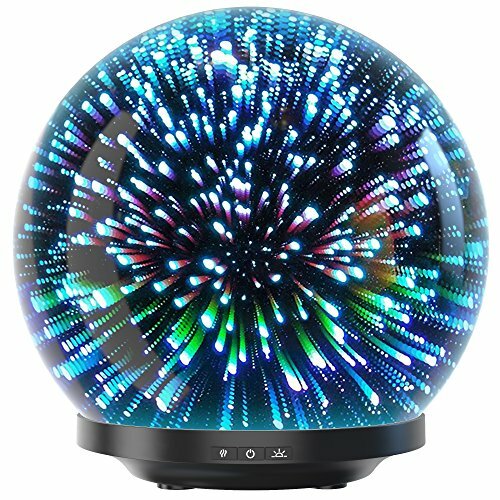 The starburst pattern combined with the futuristic globe is mesmerizing and makes a statement. This would be perfect for children. I can’t imagine any child that wouldn’t be impressed or excited by this. The water reservoir holds 230 ml of water and is easily accessible. Just lift the glass globe up and you’ll see the plastic reservoir and mist spout. It’s a pretty neat design. It runs for up to 6 hours and can be set to different time settings from 1 hour, 2 hours, and non-stop. Once all the water evaporates, it will shut off automatically. The lights can be set to one of seven colors. You can either pick one color or switch the lights off. It’s not bright enough to project on the wall, but it is still very colorful. A pretty and classic design, this humidifier takes up little space and fits in with any decor. From a distance, it looks completely like a ceramic vase. Unless you turn it on, no one would know it was a humidifier. The slim design would be suitable for a small room and the water capacity is 110ml. It can run for up to 3 hours non-stop or for 6 hours when set to intermittent mist setting. When the water completely evaporates, it will shut off automatically. 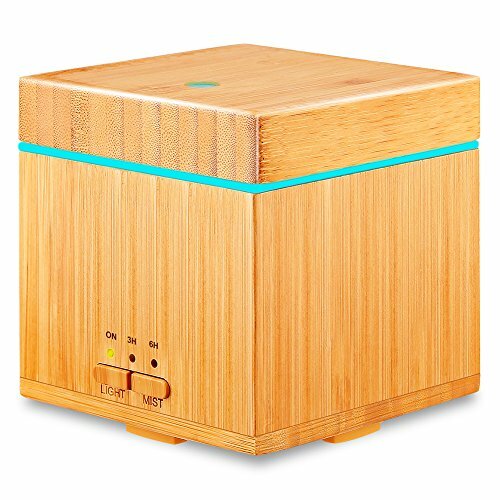 The humidifier can be used with or without essential oils. Since it’s on the smaller side, I recommend using this mostly with essential oils as a diffuser. It might not provide enough moisture for you if you are looking to treat any symptoms of dry air. Thanks to customer feedback, it has been redesigned to be used with the light on or off. It looks very pretty with the light on, but I can see why some people wanted the option to switch it off. Used as a humidifier or an oil diffuser, the tear-drop shaped design creates an effective mist. If the thought of color-changing lights is a bit too much for you, this one only features white light. In the photo, it looks slightly golden, but it’s actually more of a white light. The water tank holds 200 ml of water and will run continuously for up to 6 hours. I’d recommend using this in a bedroom or similarly smaller room. The only downside is that there are no timer settings, so it’s either on or off. It’s quiet and does not have any beep sounds like some humidifiers do. I like that it is straightforward to use and doesn’t require too many button settings. The light can be set to dim, bright, off, or a light that gently fades in and out. I found that the fading light setting helped me to sleep quicker, due to its hypnotic effect. 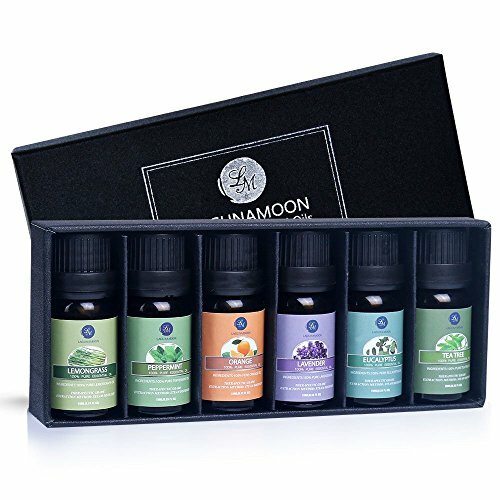 This lovely set of six essential oils from Lagunamoon, is a good introduction to essential oils. Each bottle has 10ml of essential oil that is additive-free and FDA approved. The glass bottles protect the oil from UV light thanks to the dark amber glass they are contained in. This set features lemongrass, peppermint, orange, lavender, eucalyptus, and tea tree oil. They are 100% pure and smell strong and clear. Only a few drops are needed to use them with a diffuser. Whether you are just starting out using essential oils or are an aromatherapy fan, this set of 9 popular essential oils will make you feel relaxed and invigorated. The oils that come in this set are lavender, tea tree, lemongrass, lemon, eucalyptus, frankincense, rosemary, peppermint, and sweet orange. Each oil is pesticide-free, GMO-free, additive-free, and herbicide-free. They are poured into amber glass bottles that are 10 ml each and protect the oil from UV light. The oils come in a small storage box and also come with a free recipe book that has over 200 oil combinations to try. Everything is recyclable too, from the storage box to the glass bottles. One of the best uses of a humidifier is with a few drops of essential oil. Humidifiers diffuse the oil into the air, creating a pleasant scent that gently take over a room. This set of 6 well-loved essential oils, is a lovely way of customizing the scent in your room. The oils in this set are peppermint, tea tree, rosemary, lavender, eucalyptus, and frankincense. Each bottle contains 10 ml of oil, which go a long way. To protect the oil from UV light, they are housed in dark amber glass. 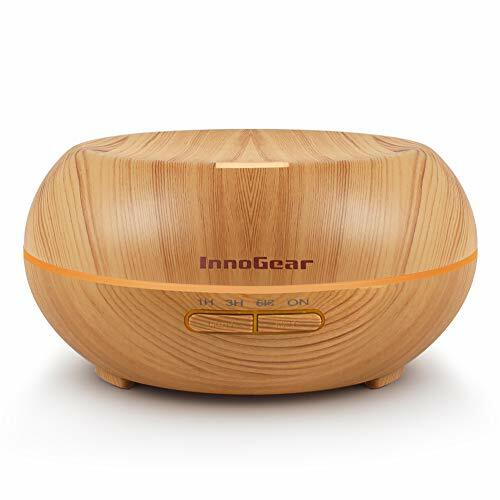 Whether you use a humidifier or an essential oil diffuser, both can offer positive benefits to your health and emotional well-being. They can also be used for practical purposes, like to purify the air or to keep bugs from your house. What are your thoughts on humidifiers? Do you have any favorites?